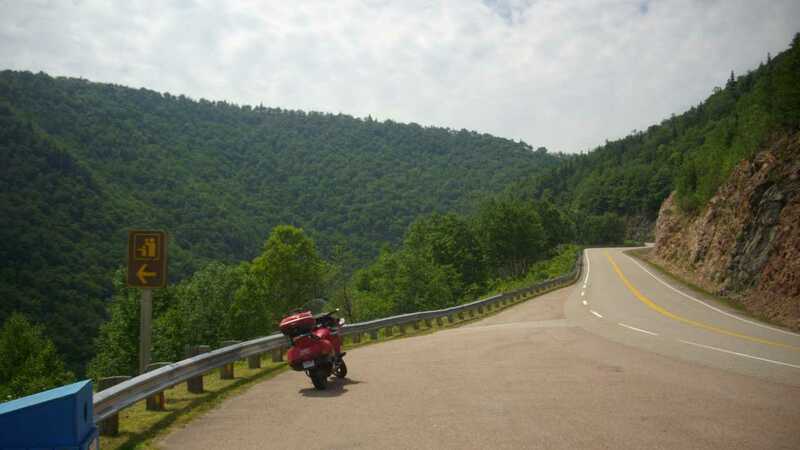 Ask an American rider where the best motorcycle road is, and they'll typically tell you it's the Tail of the Dragon, with 318 curves in 11 miles and no driveways or intersections. The Dragon is certainly on my bucket list and sounds like a great time. Everyone knows about it, though, which means lots of traffic, ever-present law enforcement, and less fun. What if I told you there was a much longer beautiful scenic ride in eastern Canada, with smooth, rolling, twisty roads and practically no traffic or cops? It's called the Cabot Trail. 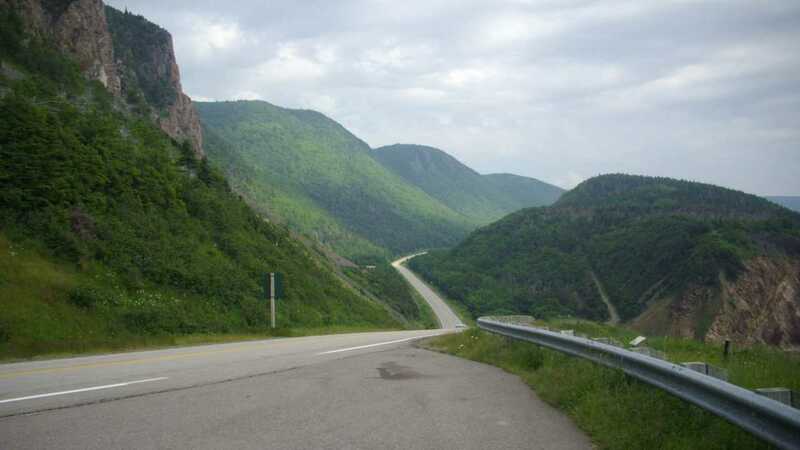 The Cabot Trail is a 300 kilometer (186 miles in Freedom Units) loop around the northern half of Cape Breton Island, which is on the eastern end of Nova Scotia. The name of the province literally means "New Scotland," which is what Scots fleeing the Highland Clearances thought of it upon arrival, reminding them of home. Though some French Acadian influence remains in areas like Cheticamp, this Scottish heritage shows proudly throughout most of the island. Bilingual road signs are no surprise to visitors to Canada, but here, the two languages are English and Gaelic, not French. 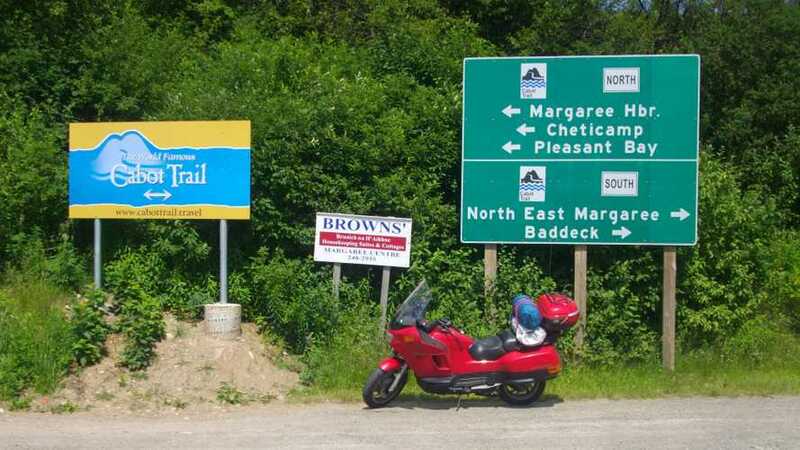 The biggest debate among Cabot Trail visitors is which direction to ride it, clockwise or counter-clockwise? Each way has its advantages. The majority of people go clockwise, which itself is a reason not to. Going counterclockwise can put you closer to some cliffs, though, which may not appeal to people who have issues with heights. The general consensus is to simply try it in both directions and figure out which way you prefer. You can ride it both ways in a single day if you don't stop very much. For me, stopping along the way was part of the appeal. 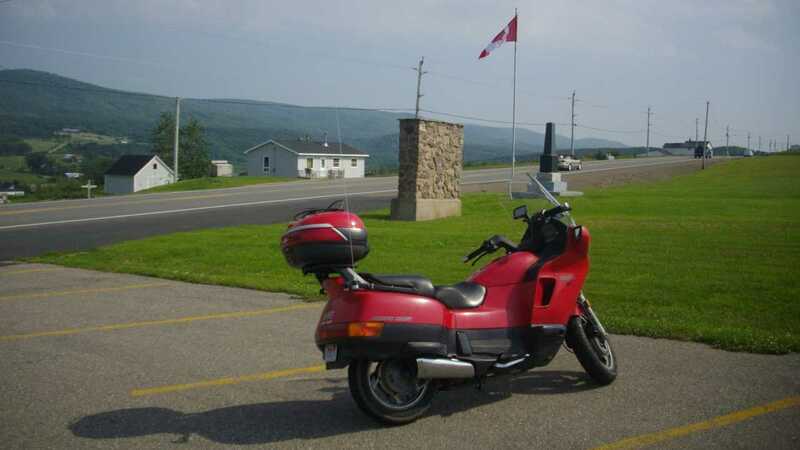 I wasn't out to set any speed records (especially not on a Honda Pacific Coast 800), and I wanted to stop and admire the beautiful scenery Cape Breton has to offer. 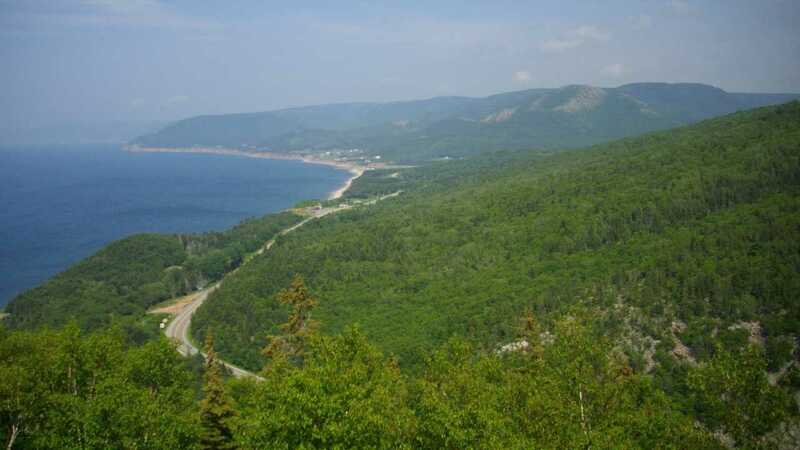 The Cabot Trail winds through both the eastern and western edges of Cape Breton National Park. To transit straight through is free, but if you so much as put a foot down anywhere you're supposed to pay the park entrance fee. I recommend doing it. That way you have the freedom to stop and look around wherever you want, as I did at Green Cove and other places throughout the park. If you're a hiker, there are many trails you can take to even more scenic views than you can find on the road. The road itself is maintained in excellent condition. This is particularly notable because this area has harsher winters than most of the U.S. The Cabot Trail winds through seemingly endless hills and valleys on its way around the northern end of Cape Breton Island. These pictures show how little traffic I encountered in this sparsely populated area. Much of the Cabot Trail runs next to the ocean as well. This view from the top of MacKenzie Mountain lets you see for miles... I mean, kilometers up the road to the north. The climb is pretty steep as well. While stopped here, I could clearly hear the distinctive note of a BMW with a nice aftermarket exhaust for a good five minutes as it approached and climbed the mountain below me. Unlike some Harleys, that BMW's exhaust wasn't excessively loud, either. It just took that long for the rider to tackle the switchbacks below me. A similarly technical climb, or descent depending on your direction, awaits you on Smokey Mountain on the eastern end of the Trail. This is only the tip of the iceberg of amazing Cape Breton Island riding. I haven't even mentioned the side trip to Bay St. Lawrence, or the dirt road out to Meat Cove. I only had a week to take the trip from Massachusetts to Cape Breton, nearly 800 miles away, and back. My time was sadly limited in what I consider the most beautiful place I've ever been. I need to go back someday and plan my trip a little better to see all the sights I missed last time. 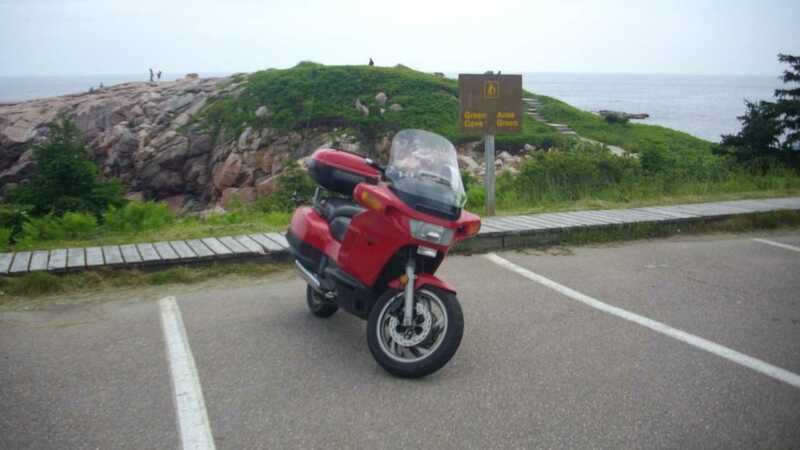 Since my trip, I discovered the Cabot Trail Biker website, run by a local to the area all kinds of great insights to places riders should be sure to visit during their rides. I'll be back one day.